It’s no secret that diet is a huge factor when it comes to high blood pressure (and most other health issues). Research is continuously finding that simply by adjusting dietary habits, like including more fruits and vegetables, for example, hypertension is an issue that can be resolved without pharmaceutical medications. Offering even more evidence for adjusting diet to boost overall health, a recent study has found that drinking a glass of beetroot juice daily is enough to lower blood pressure by 7%. In the small study, published in the American Heart Association journal Hypertension, 15 participants drinking 8 ounces of beetroot juice daily experienced a reduction in blood pressure of about 10 mm Hg. The beetroot juice contained about 0.2 grams of dietary nitrate. The same nitrate levels can found in a large bowl of lettuce or 2 beetroots. “Our hope is that increasing one’s intake of vegetables with a high dietary nitrate content, such as green leafy vegetables or beetroot, might be a lifestyle approach that one could easily employ to improve cardiovascular health, ” said Amrita Ahluwalia, Ph.D., lead author of the study and a professor of vascular pharmacology at The Barts and The London Medical School in London. Full of nitrates, 20 times that of most other vegetables, the beetroot may just be an amazing new find for scientists and nutritionists alike, as its healing powers are slowly discovered study by study. 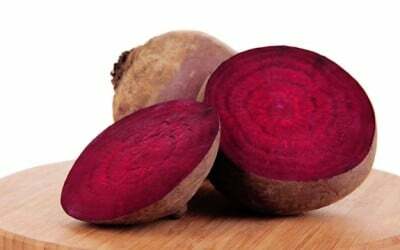 Due to the influx of the beetroot nitrates, the production of nitric oxide is increased. This is how beetrot juice can widen and relax blood vessels. In turn, blood pressure is improved. “We were surprised by how little nitrate was needed to see such a large effect. This study shows that compared to individuals with healthy blood pressure much less nitrate is needed to produce the kinds of decreases in blood pressure that might provide clinical benefits in people who need to lower their blood pressure. However, we are still uncertain as to whether this effect is maintained in the long term,” Ahluwalia said. “This promising study shows that it may be possible to reduce high blood pressure by eating more foods that contain large quantities of nitrates, such as green vegetables and beetroot. And this isn’t the first study to find that beetroots are able to lower blood pressure. Another 2010 study showed a correlation between daily intakes of beetroot juice and near-immediate drops in the drinker’s blood pressure. What’s more, it was also found that those with higher blood pressure experienced a greater dip from the juice. The health benefits of beetroot juice go far beyond that of lowering blood pressure. Check them out for yourself.